Karen supports all types of businesses to incorporate new innovative ideas and solutions in ICT, Creative and Software Technologies. Karen has knowledge of industry issues and trends, particularly in bespoke software solutions in order to ensure cost saving, improve security and enhance productivity. Karen specializes on Database Development such as Customer Relationship Management Systems, add-on cloud solutions for existing software such as merging software’s in order to improve productivity, website/mobile design and development using cloud based solutions, Basic Cyber Security awareness for businesses, Search Engine Optimization (ensuring that you are searchable online), Google Analytics/Facebook Insights (Statistical information useful for enhancing customer/client base), Designing Marketing Material such as Business Cards/Leaflets/Gift Vouchers etc and enhancing and giving advice on Digital and Social Media Techniques. Karen also carries out any necessary enhancements and developments on the SWC Customer Relationship Management System (CRM) for each of the Innovation Centers. Karen has over fourteen years’ experience working in creating ideas and solutions for ICT, Creative and Software Technologies. In 2009, Karen took up post in South West College where she has worked with numerous of businesses who were successfully approved on one of the funding mechanisms that the InnoTech Centre currently offer. She carries out a varied range of new technology solutions in order to meet the ever changing demand of technologies in today’s business world. She has managed Council Partnership Projects on behalf of SWC to ensure targets and budgets were successfully met. Karen teaches on a part-time basis on subject areas such as Web Development, Digital & Social Marketing and Cyber Security. 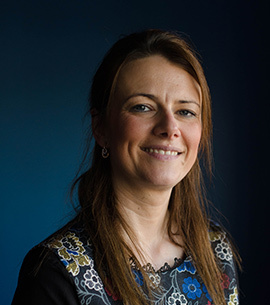 Karen has a BSc Foundation Degree in Web Technology and Ecommerce with Queens University, Belfast and is currently topping up her Foundation Degree to an Honors degree by studying a BSc Hons in Computing and IT Systems from Open University. Karen has obtained her certificate in Cyber Security with University of Ulster, Jordanstown and has successfully gained her FAST Software and Auditing Certificates.